"In the Name of the Father and the Son and the Holy Spirit! "Often, events occur during our lifetimes the meaning of which we do not fully comprehend. Twenty-five years ago, the Council of Bishops of the Russian Orthodox Church Outside of Russia, headed by its First Hierarch, His Eminence Metropolitan Philaret, glorified the Holy New Martyrs and Confessors of Russia. The path leading to their canonization was difficult, for there were various opinions on this matter, some people even being against the glorification of the Royal Family. Still, our bishops displayed their spiritual courage. The events that followed proved that this conciliar decision was the expression of Divine Will and a fateful act, which laid the groundwork for the rebirth of the life of the Holy Church in the homeland. The culmination of this expression of the freedom of the Church was the historic Jubilee Council of 2000 and the glorification of the Holy New Martyrs and Confessors of Russia by the fullness of the Russian Orthodox Church. "From a spiritual point of view, one can now say that after the glorification of the New Marytrs, a pre-conciliar period began, which concluded with the decision by the IV All-Diaspora Council held earlier this year on the need for the reunification of the two parts of the Russian Orthodox Church. "Those of us who remember and who were fortunate enough to see Vladyka Metropolitan Philaret over his 20 years of service as First Hierarch of the Russian Church Abroad cannot picture him without his devoted assistant and cell- attendant, Father Protopriest Nikita Chakiroff. Fr Nikita spent all his energies, all his strength and his whole life to serving his Abba and spiritual father. Both during life and after the repose of Vladyka Philaret, Fr Nikita continued to fulfill his wishes and preserve his spiritual legacy. "And what is the spiritual legacy of Vladyka? He can be seen not in the everyday responses to current, temporary church events of his day, but in the main prayer of his life, that is, for the rebirth of the Holy Church in Russia and the return of the Russian people to the ideals of Holy Russia. Dear in the Lord Fr Roman! Bless me! Soon after Vladyka Metropolitan Philaret's repose, with the knowledge of Vladyka Laurus, I left a second set of episcopal vestments of Vladyka First Hierarch, which I paid for with my own funds, so that it would be packed away and given to you, Fr Roman, for safekeeping. My health is poor, and the doctors say that I will not live long; that is why I leave them to you to safeguard, and when the time comes, when the Lord frees Russia, our Homeland, when blessed days arrive, foretold by St Seraphim of Sarov the Wonder-worker, then take them to our Homeland. Give them to His Holiness the Patriarch of All Russia, and one set must be given to Diveevo Lavra, and tell them whose they were. 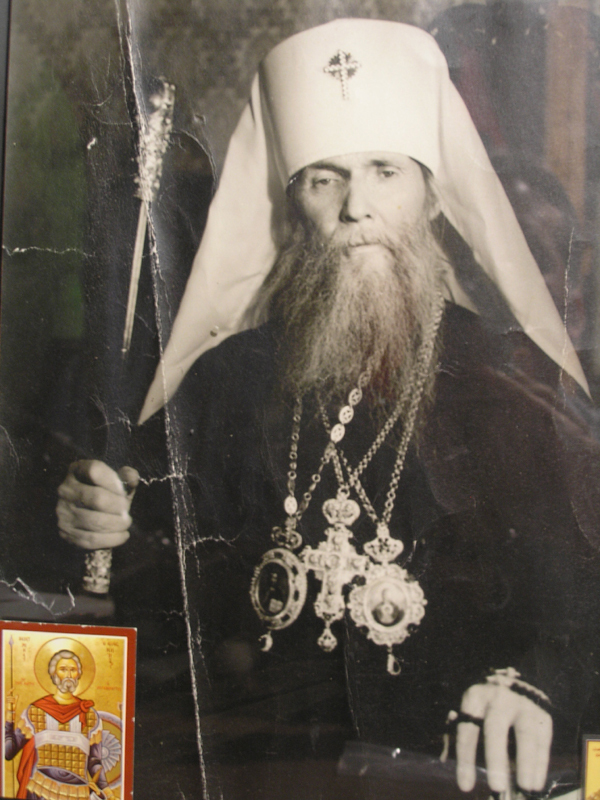 Say that we preserved them as a treasure, and say that Vladyka Metropolitan Philaret, as he performed the rite of the glorification of the Holy New Martyrs and Confessors of Russia, in his sensitive soul, endured the suffering of every martyr and rejoiced at their staunchness and unwavering strength and devotion to the Truth. Metropolitan Philaret performed the great deed of glorification in 1981. With conciliarity and with the whole people, in a great church ceremony he glorified the many millions of new Saints of God. Here I end my letter. I ask you holy prayers and blessing. "And new, dear brothers and sisters, the time has arrived to fulfill the wishes of Metropolitan Philaret and the will of Fr Nikita. "Today, in our church, Fr Roman will hand over, through Archimandrite Tikhon, Prior of Sretensky Monastery in Moscow, the vestments of that First Hierarch who glorified the New Martyrs abroad to that First Hierarch who glorified them in Russia. "Brothers and sisters, let us remember the power of prayer and the power of the All-Holy Spirit, Who will overcome our mortal failings and lead us unto Truth. "The path towards the glorification of the Holy New Martyrs was not easy. The path to the adoption of the 'Act of Canonical Communion,' which combines in the Eucharist both parts of the Russian Church, was also difficult. But these spiritual feats were finalized successfully by conciliar decision of our archpastor after long, prayerful preparation. "Fr Nikita's letter is remarkable! Who could have foreseen, in 1987, when Diveevo Monastery was still closed, when confessors continued to suffer for Christ under the godless regime, who could have foreseen the coming emancipation and transformation of church life in Russia? Who especially could have thought that this would come to be during the lifetime of Fr Roman? Fr Nikita's letter is nothing less than prophetic. And behind Fr Nikita's words in this letter, one hears the prophetic voice of Vladyka Philaret. "Now we will serve a pannikhida for the late Metropolitan Philaret of blessed memory, and for Protopriest Nikita. In raising our prayers for their peace, let us thank the Lord that the 'blessed days foretold by St Seraphim of Sarov the Wonder-worker' have arrived, thanks to which we can now fulfill the testament of our spiritual father, Vladyka Metropolitan Philaret. Amen!" After Divine Liturgy, the vestments intended for the Patriarch of Moscow and All Russia, and for Diveevo Monastery, were taken out of the altar into the middle of the church and laid beside the pannikhida table, where Fr Roman led the commemorative service along with Fr Victor, Protopriest Alexei Mikrikov and the parish clergymen. After the singing of Eternal Memory , the Parish Rector then welcomed Fr Tikhon and spoke about the life of Vladyka Philaret. In a moving response, Archimandrite Tikhon noted the importance of this event for the Russian Orthodox Church and gave Fr Roman a pectoral cross from His Holiness, along with an icon of Holy New Martyr Archbishop Ilarion (Troitsky) of Verey, containing a portion of his relics, for Epiphany Church. The choir, under the direction of Vladimir Pavlovich Roudenko, then sang Bortniansky's Tebe Boga khvalim , and for a long time, the multitude of worshipers approached to venerate the vestments of the third First Hierarch of the Russian Orthodox Church Outside of Russia. See Fr Nikita's letter in pdf format here.